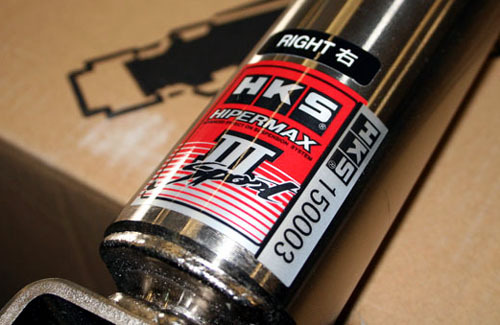 HKS USA now offers the full HiperMax III line in North America. The Hipermax III, Hipermax III Sport and Hipermax CLX is now available in North America through Authorized HKS Dealers and HKS Certified Pro Dealers. The HKS Hipermax III suspension line is backed by a 1 year limited warranty. Drawing upon more than 35 years of experience building high-performance equipment for the world’s most discriminating drivers, HKS is the premier manufacturer of automotive performance systems. The Hipermax III line is available in three series, all specifically tuned for North American driving conditions: The Hipermax III series strikes a balance of track performance and a smooth ride. Hipermax III Sport is tuned for serious track performance. And the Hipermax III CLX series is designed for luxury cars to seamlessly blend fantastic handling and feedback with a smooth ride, even on less-than-smooth pavement. Series Concept: Designed and tuned for street application / daily driving. With the Hipermax III suspension series, the driver gains increased wheel control with improved performance of all vehicle dynamics and increased driver command in all conditions. Hipermax III combines track-quality control with excellent ride and handling characteristics at real-world street speeds. HKS’ all-new Hiper Linear Piston Fluid Channel System damping system creates a positive relationship between piston speed and damping force, making it possible to produce a suspension that provides track-level control and feedback with exceptional ride quality at the same time. • Hiper Linear Piston – Linear progression piston adjusts oil passages for precise stroke management resulting in smoother valve movements. As piston speed increases, dampening rate linearly increases. • Stainless lock nut & ride height adjuster – feature anti-rust & corrosion characteristics for enhanced durability. • Non-electrolysis Nickel plated shock bodies provide durability in severe weather conditions. Series Concept: Designed and tuned for competition / track. 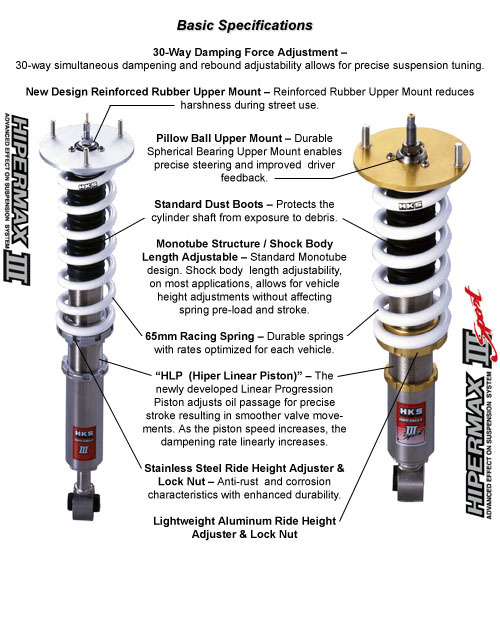 The Hipermax III Sport series has firmer spring rates and valving to take advantage of the smoother, more consistent pavement of race tracks allowing quicker, more precise transient response and instant direction changes necessary in competition. In addition, the Hipermax III Sport incorporates HKS’ all-new Hiper Linear Piston fluid-channel system, shock-body length adjustability (most applications) and ultra-thick chrome plating of the cylinder shaft for excellent durability and reduced stiction (static friction). Spherical bearings, for precise steering and feedback, are standard – but reinforced, rubber upper mounts are available for those seeking reduced vibration from less-than-smooth pavement. • Hiper Linear Piston – Linear progression piston adjusts oil passages for precise stroke management resulting in smoother valve movements.. As piston speed increases, dampening rate linearly increases. Series Concept: Designed and tuned for luxury performance. Hipermax III CLX is the proof that luxury and performance need not be mutually exclusive. Designed for BMW, Infiniti, Lexus, Acura and other premium brand automobiles, the CLX series Hiper Linear Piston combines smooth, quiet ride characteristics with enhanced handling capability and the ability to set precise ride height for reduced pitch and roll with the shock-body-length-adjustability feature (most applications). HKS’ new reinforced rubber mounts provide unsurpassed insulation from road harshness, while thick, chrome plating on the cylinder shafts and standard dust boots provide excellent durability and longevity. Tuned specifically for challenging expansion joints, uneven pavement and the frost heaves of North American roads, Hipermax III CLX is possibly the single best upgrade you can offer your luxury performance automobile. Find out more at HKS USA.